Does the future look like the past for subway expansion? 2011 would have been an important year for the TTC and Toronto in general had everything gone according to plan. In 1985 the TTC unveiled a 28-year $2.7 billion blueprint for an expanded transit system called Network 2011 -- scheduled to be completed in what would now be next year. It consisted of five major projects meant to service the growing downtown core and the new urban sub-centres of North York and Scarborough. Specifically, it called for the construction of a Sheppard Avenue subway line from Downsview station to the Scarborough Town Centre, a downtown relief line running from Pape to Union stations, and a rapid transit line running along Eglinton to Pearson international airport. The TTC hoped that by the time Network 2011 was finished 62 per cent of Metro Toronto's population would be within 1.25 miles of rapid transit service. The plan was marketed as highly affordable too, with 75 per cent of the financing supplied by the province. Many saw Network 2011 as the absolute minimum Toronto would have to build to accommodate the city's growing workforce and need for transportation. Clearly the proposal was never put into place. Only a segment of the Sheppard subway line was built, and the rest of the projects never materialized. And as we approach the scheduled completion date of Network 2011, we're in the almost the same position as we were in 1985. One of the reasons Network 2011 failed is because it was introduced in the midst of a turbulent year in Ontario politics. The Ontario Progressive Conservatives, who had been in power for 42 years and were responsible for much of Toronto's transit growth since Metro's creation, were defeated on a motion of confidence after winning a minority government in the 1985 election. The move brought in a Liberal government under David Peterson supported by the NDP. Together the two parties stalled on Network 2011 until it fell apart. Transit Toronto speculates that had PC Premier Bill Davis remained in power the project would have been built. But the failure of Network 2011 is an example of a broader transit problem in Toronto. This wasn't the only opportunity missed. The city has consistently failed to expand its subway system, with small exceptions, since the completion of Kipling and Kennedy subway stations in the early 1980s. So what gives? I asked a few experts what explains this broader failure. James Bow, senior content editor at Transit Toronto, told me one reason for the lack of subway growth has to do with Toronto's growth patterns. 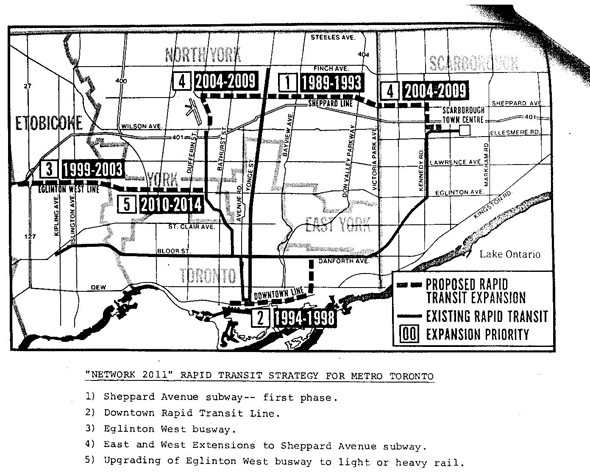 After the completion of the Yonge/Spadina-University and Bloor-Danforth lines, TTC planners believed that the city's sprawl wasn't dense enough to be served by more subways. James Mars, a professor at Ryerson's School of Urban and Regional Planning, listed several reasons for the slow growth of Toronto's transit: the failure to create a GTA wide planning agency like Metrolinx sooner, the Ontario Ministry of Transportation's bias in favour of highways, and the lack of consistent national funding for transit. And David Amborski, also a professor at Ryerson's School of Urban and Regional Planning, says the biggest factor is the lack of federal support for Toronto's transit system. But with the upcoming mayoral election and subway expansion being proposed by several candidates isn't there reason for optimism? I'm afraid not. Adjusted to inflation, Network 2011 was a $4.98 billion project. George Smitherman's transit plan is supposed to cost $17.4 billion and Sarah Thomson's is estimated at $14 billion. If we couldn't get a $5 billion project going, what are the chances we'll manage with plans costing three times as much? Network 2011 was killed by a Liberal government in the late 1980s, and today's Liberal government is somewhat similarly stalling on Transit City. And other than the creation of Metrolinx, we haven't fixed many of the problems facing transit. It appears no one factor is responsible for this failure, just a series of small failings spread over many years. "It's a perfect storm, I guess," Mars says. Photo by wvs of the blogTO Flickr pool. Map of Network 2011 from the Toronto Archives.